Whether you’re sharing original content or supporting an event, social media is vital to reaching your audiences. Communications Initiatives can help you plan a strategy, identify appropriate platforms, and advise on best practices for your social media campaigns. Contact us to learn how we can optimize your social media strategy. 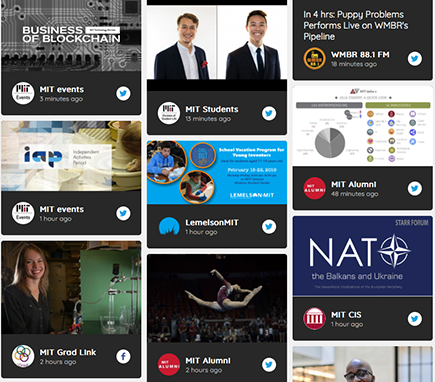 MIT Social Media Hub is the Institute’s portal for all social media content. Learn more about MIT’s policies and best practices.